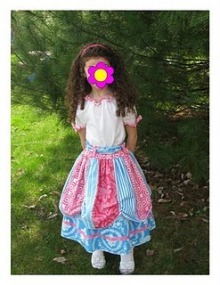 The Sweet Savannah skirt is the latest pattern from Squiggly Twigs Designs. With a gathered overskirt, it looks like it stepped straight out of a fairy tale. As with all of their patterns, you draft the pattern yourself based on your measurements using the instructions provided. Read more at Squiggly Twigs Designs blog.